The morning of May 20th, 2013 began as any other chase day for me, tired from staying up too late looking at the models and not being able to sleep as I was excited for the upcoming chase. Lauren and I were especially tired this day due to having chased non-stop the last 4 days. May 16th and 17th we were up in western South Dakota then drove practically all night down to central Kansas for May 18th and caught the Rozel, KS tornadoes. We then chased southern KS on May 19th, also catching a couple brief tornadoes before heading south to stay the night of the 19th in Norman, OK for the upcoming May 20thchase. Total combined sleep from these 4 days equaled just over 12 hours…adrenaline and excitement can go a long way as a natural sleep inhibitor. I have chased many times in central Oklahoma since spring of 2009 when I moved down to attend OU and have chased many “high-end” days here as well. By “high-end” days, I mean good parameters and atmospheric conditions possible for long track tornadoes/tornado outbreaks and May 20th wasn’t any different. Luckily, none of these previous chases ever led me into the metro of OKC, nor had there been any significant tornadoes affect the OKC metro since I began chasing in Oklahoma. There were some close calls with some strong tornadoes in 2010 and 2011 and a very weak tornado moved through the center of Norman in 2012, but overall nothing significant in the metro since the Moore EF3 in 2003. 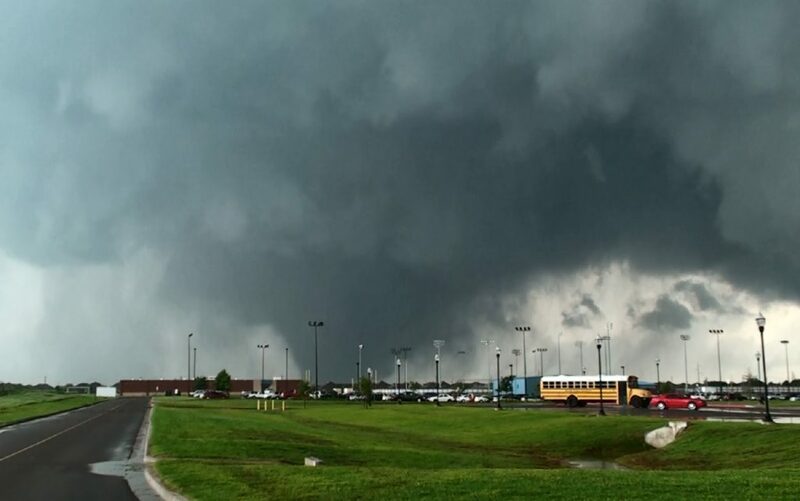 I was on a different storm in southwest Oklahoma the day the tornado hit Norman in 2012 and was on separate storm in northwest Oklahoma when the strong tornadoes just missed Norman/Moore to the east in 2010. I had come down through OKC on I-35 to catch the end of the Goldsby tornado in 2011, but came through the metro and got out of the populated areas before the storms got too close. So all in all, I had never chased in a densely populated area before May 20th; although, the thought of the OKC metro taking a direct hit from a devastating tornado while we were chasing was always in the back of my mind and knew it would eventually happen again. When I thought about this scenario I knew people would be panicking, especially if the tornado was clearly visible coming into the city. As seems logical, I thought traffic would be hectic as people would be trying to flee if they could, but to what extent this would be a problem or how clogged the roads might become I wasn’t sure. I hoped I would never have to have to deal with this scenario, but if it occurred I planned on playing it “safe” and positioning farther away to possibly account for some traffic and still get out of the way if needed. This scenario is all good in your head, but is a completely different story when you’re dealing with it in real life. We started the chase on May 20th by dropping south to Purcell, OK and waiting at a gas station by I-35 for storms to develop. After about an hour of sitting at the gas station a storm started developing to our west and began organizing pretty quickly. We went about 10 miles west to get a bit closer and wait for it to organize more before we truly committed to that storm. While we were monitoring the storm to our SW, another storm had developed to our northwest and was also rapidly intensifying. At this point we had to choose which storm to go after. We made the decision to go back north to catch the northern storm as there appeared to be a surface boundary of some sort evident on radar earlier in the day and the updraft was very crisp and went up like an atomic bomb. We then raced back to I-35 and went north with the base of the storm emerging from the haze to our west when we crossed the Canadian river. We continued north on I-35 to exit 116 or SW 19th street and pulled off on the east side of the interstate into a parking lot by the McDonald’s. Lauren was driving and made the decision to exit here due to very slow traffic up ahead from the hail core crossing the interstate a couple miles north. As we did so, we noticed cars at the exit just north of us pulling off under the overpass blocking traffic, a dangerous thing to do as a tornado approaches. 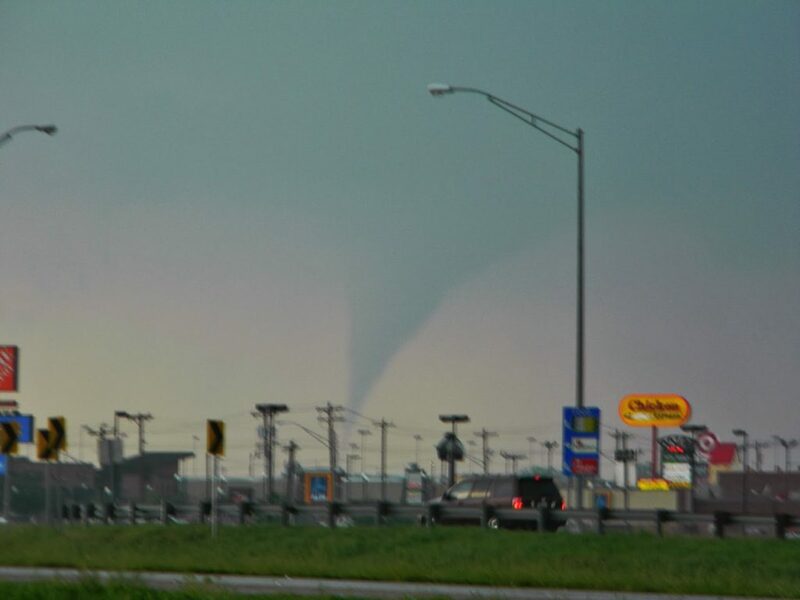 Shortly before we pulled off the interstate we could see a cone funnel through the haze to our west and by the time we stopped in the parking lot it was on the ground as a nice stovepipe tornado. The tornado rapidly grew in size and appeared to have grown into a wedge right as we decided to go west across the interstate and try for a better view on the west side of Moore. At this same time the tornado sirens started sounding a few people had stopped on the off ramp to take a look. We went west a little more than a mile and were going to continue west another mile, but Lauren didn’t have a good feeling about going further west so we went south on S. Santa Fe Ave. and pulled off in the Southmoore High School parking lot. 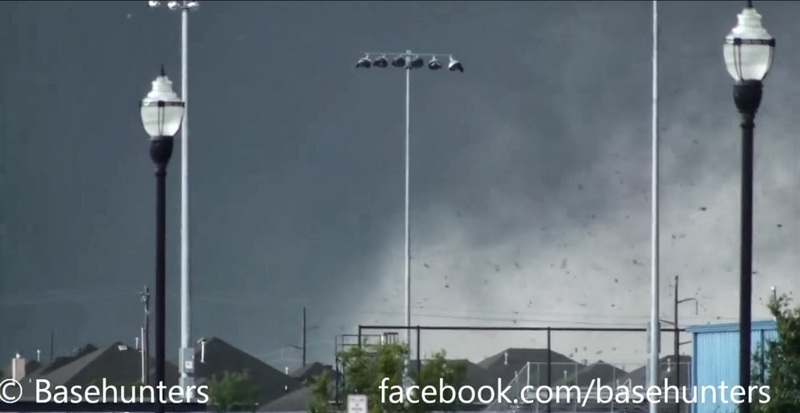 We had lost sight of the tornado due to rain wrapping around it and trees/houses once we left the parking lot where we first stopped east of I-35 and regained a visual once we had stopped in the Southmoore parking lot. There wasn’t much traffic on the couple miles of residential roads we had traveled before we stopped at Southmoore even though the sirens had been going off for several minutes. This was probably due to the tornado still being far enough to the west that it was hard to see through the trees and houses and it had become a bit rain-wrapped. 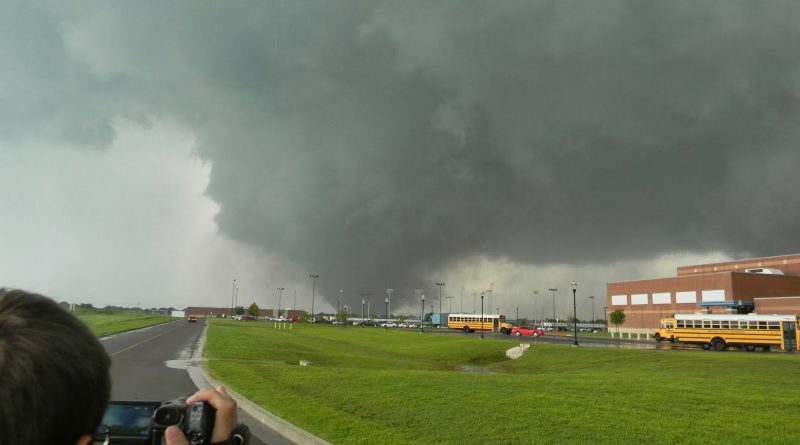 When we stopped in the Southmoore parking lot the tornado came into view as a big cone wrapped in rain to our due west. As the tornado approached it became less rain-wrapped and we could see how violent it was with debris starting to be visible around the tornado (it was about 4 miles west of us at this time). 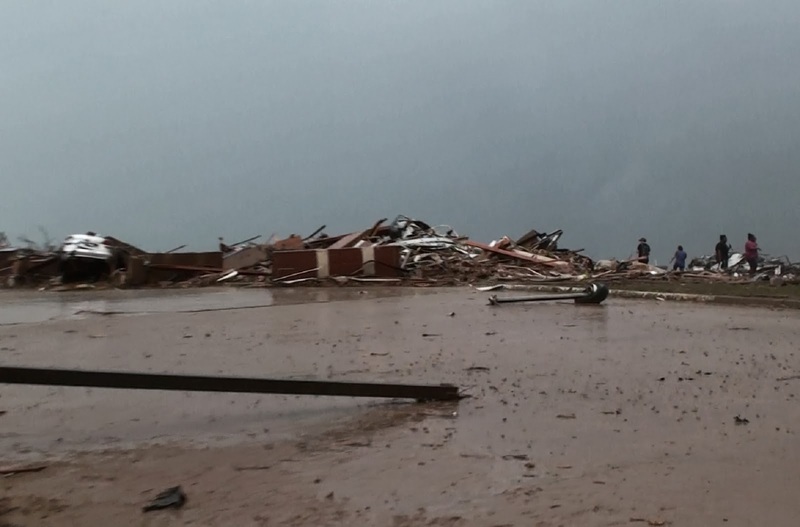 My heart sank as I knew this tornado wasn’t going to dissipate before entering town and I knew there would be fatalities given how violent it was entering such a densely populated area. 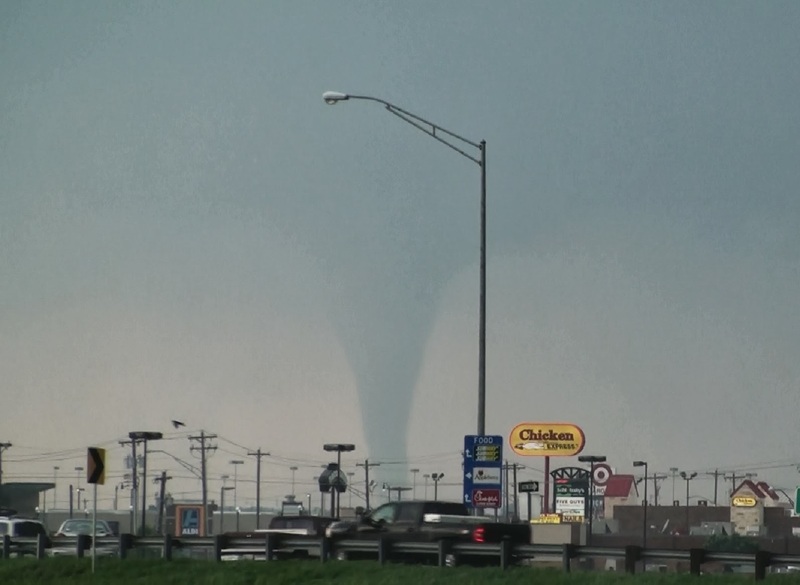 The tornado was moving mostly due east and if it continued on that track it would pass just north of our location so we stayed in the parking lot and continued to watch it approach. When the tornado was a couple miles away we could start to hear the roar, which was incredible, & terrifying. The loudest any of us had ever heard and by the time we started to leave the parking lot the roar was almost deafening like being next to a big waterfall. We left the Southmoore parking lot as the tornado was about a half mile to our NNW and had to wait awhile due to traffic at the stoplight to get back on S. Santa Fe Ave. to head south. We were too close. 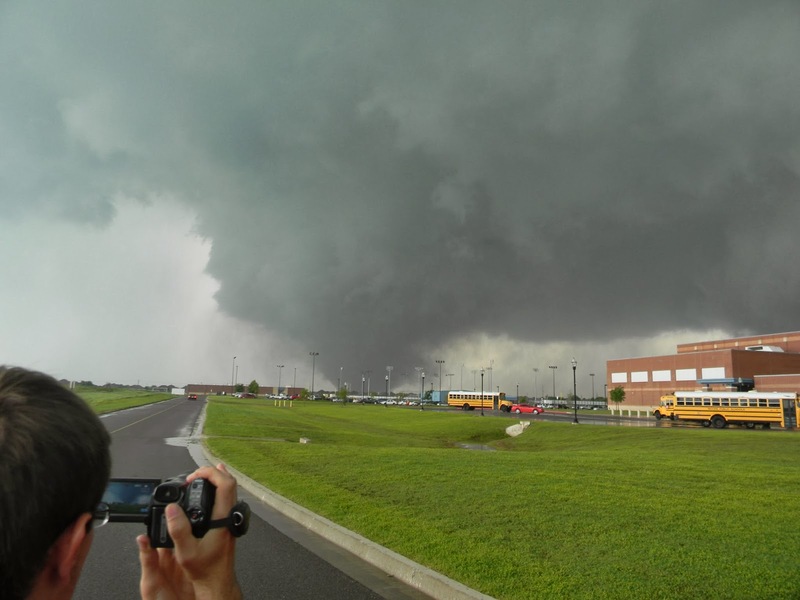 In the time we were watching the tornado in the parking lot, people saw the tornado entering town and began to panic and jump in their vehicle to flee south. The next half mile south on Santa Fe Ave was slow moving and very hectic with people panicking, cutting others off, and driving south in the northbound lanes. This was a very scary situation. Some drivers were so panicked by the tornado’s proximity and strong inflow winds they froze and didn’t drive south, just clogged up the lane. It was a miracle we didn’t get into a wreck. We then turned west onto SW. 34th and went west a mile and traffic was a bit better with most of the cars continuing south on Santa Fe. We then cut back north on Western Ave. to help with search and rescue. Once we got to the damage path it was total devastation. Houses, businesses, everything was no more than a pile of rubble near the buildings foundation in the center of the damage path. We noticed some children being helped out from what was left of a small strip mall and rushed in to assist the other couple people already there helping pull these children and several adults from the rubble. I was just praying to not find anyone who had died. The task to get the last couple adults out and away from the rubble was even more rushed when we noticed a large natural gas leak gushing gas into the air not far from where everyone was coming out of the debris. In all there were 5 kids and 3 adults that were, for the most part, ok besides some bruises and gashes here and there. We loaded them up in the back someone’s pickup and all took off as fast as we could praying the gas leak wouldn’t ignite. How those children and adults survived, I have no clue. They were crawling from rubble no more than 5 feet high with no underground shelter. We then continued south out of the damage path a couple miles after fleeing the gas leak and pulled off in a field entrance to stop to take a breath and take in all that had just happened. We stayed out of the damage path after this to not be in the way of emergency personnel as they would be making their way in to the area soon. This was a very sobering experience and later that day it really began to sink in just how close we actually got to this tornado and how a slight change in the tornadoes path could have been devastating for us as traffic wouldn’t allow us to escape quickly. Luckily, we were on the edge of town and the panicking people fleeing the tornado in traffic didn’t extend for miles. Getting this close to a tornado of this magnitude is possible and “relatively safe” if you are out in the open countryside with no traffic and nice, quick, paved escape routes. 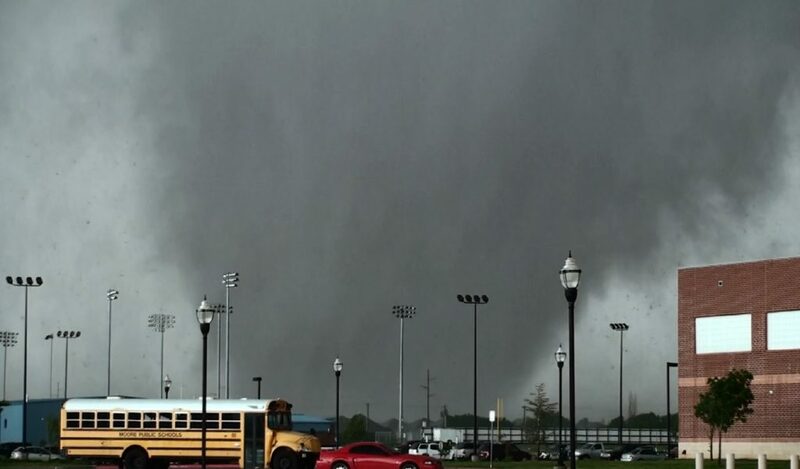 In a densely populated urban area on the other hand can easily become a death trap due to panicking people trying to flee the tornado bringing all roads to a standstill. We came out luckily this day. It was truly a wakeup call and will play days like this much differently in the future. We will do so by either avoiding the city altogether even if that means leaving the storm or trying to detour completely around the urban area and try to catch back up to the storm on the other side of town. There will always be more tornadoes to chase and it’s not worth getting killed over.